By default, all users in the same Exchange Online environment can view each other’s free/busy time. 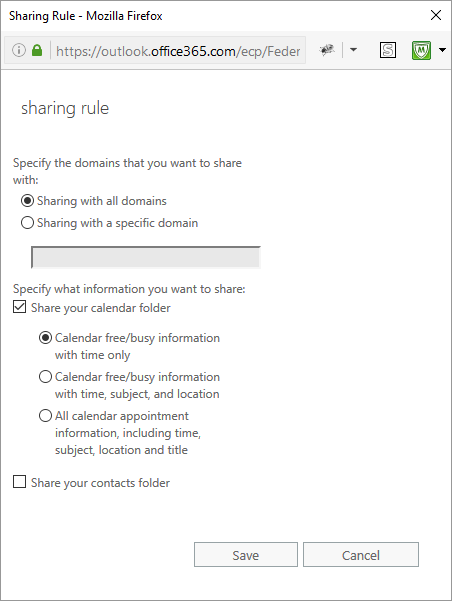 Using the Organization–Sharing settings you can share more information, but not less. Unchecking the ‘Share your calendar folder’ box does not turn off calendar sharing. Counterintuitive! Individuals can adjust their own free/busy time sharing in Outlook or Outlook Web App (OWA). But what if you have less-privileged users who should not be able to view another user’s free/busy time, for example, temporary employees or contract workers? Can they be restricted from viewing calendar information for other users? It can be done, but it’s not simple. There is no existing permission entry found for user: privileged-users-security-group. $Calendar = $Mailbox.UserPrincipalName + ":\calendar"
Fully integrating that into my account creation process is a job for another day. One other thing to note: users can still choose to modify their free/busy sharing with the Default user, in case they do want/need to share their availability with all users in the organization.